Free Boston Duck Tours on July 3-5, 2014! Update: Looking for duck tour discounts and offers for the 2016 season? Yoplait Greek has teamed up with Boston Duck Tours to sponsor three special Yoplait Greek Ducks from July 3, 2014 to July 5, 2014 and will offer a limited number of free rides each day. This is a great opportunity to ride on a Boston Duck Boat for free! You must visit a Boston Duck Tour ticket booth (Prudential Center, Museum of Science or New England Aquarium) on the same day to try to grab a free tour ticket! Tickets are on a first-come, first-serve basis, so make sure to get there early if you are interested. There are 480 tickets available on July 3rd and July 5th and 390 tickets available for July 4th. Each guest can claim up to 4 tickets and infants must be ticketed, but tickets will only be released for the same day. For more information about Free Boston Duck Tours thanks to Yoplait Greek, please head here. 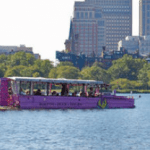 Don’t forget these tips for discount tickets for Boston Duck Tour tickets this season if you are unable to take advantage of this great deal from July 3-5!